The exceptional Haute Joaillerie Crazy Flower watch was widely acclaimed when Breguet introduced it. Thanks to its mobile settings, the timepiece reacts to the slightest movement, like the opening petals of a diamond flower. Breguet has unveiled an even more exceptional CRAZY FLOWER, entirely paved in diamonds. The bracelet is set with 120 baguette diamonds, extending the creation’s brilliance. At the heart of this sparkling flower, a dished dial consists of 206 brilliant-cut diamonds in an ‘inverted’ setting, while the dial’s edge is set with another 66 brilliant-cut diamonds. The trademark Breguet hands in polished steel have been bent by hand to parallel the curve of the dial. Twenty baguette diamonds compose the chapter ring for the hours. Every movement of the wrist brings the diamond petals to life, achieved by the mobile attachment of 193 baguette diamonds to the watchcase. More than 76 carats of diamonds surround this exceptional piece in a blaze of glory, demonstrating once again the skills of Breguet jewellers. Once again, Breguet High Jewellery displays stunning boldness in the design of contemporary gem-set pieces. The CRAZY FLOWER weds the pure beauty of diamonds to the technical daring of a mobile setting. It houses a calibre 586 self-winding mechanical movement. The watch case features asymmetrical rows of baguette-cut diamonds mounted on minimalist settings affixed to the case from the middle section up to the bezel. And 116 baguette-cut diamonds will thus oscillate back and forth in a graceful and subtle dance reminiscent of wind-ruffled petals. The dial comprises 206 brilliant-cut diamonds ‘inverse-set’ on a concave face rimmed by a flange set with a further 66 brilliant-cut stones, and enhanced with an hour circle composed of 20 baguette-cut stones. Over 36 carats of diamonds glimmer in wondrously fine settings. This dazzling tour de force comes with a Crazy Flower Haute Jewellery suite, made up of a ring featuring a blooming-flower motif along with ear pendants and motifs also displaying mobile diamond clusters. All making for petalled perfection! Breguet offers the REINE DE NAPLES CHARLESTONE BRACELET and the REINE DE NAPLES MINI PINK GOLD to up the style quotient. The Charlestone bracelet is defined by its brilliance. 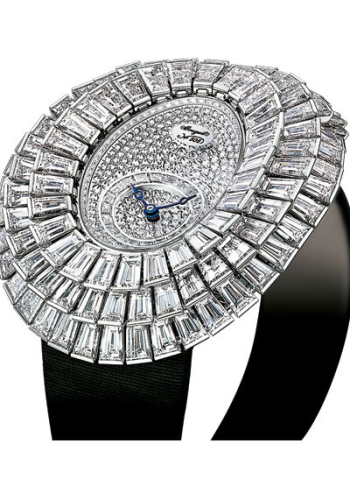 Set with 139 diamonds totalling 1.32 carats, it also has a sapphire crystal case back and a mother-of-pearl dial. The beauty lies in its understated elegance. The white and gold links beautifully complement each other to place it in the league of a masterpiece. As for the Mini, sparkling, high-quality diamonds bring to life every part of this exceptional timepiece. A magical alliance of shimmering diamonds and lustrous mother-of-pearl composes its pave-set dial. The graceful calligraphy of Breguet numerals on the mother-of-pearl chapter ring, the blued steel hands and the caseband fluting confirm that this timepiece is indeed a Breguet, whose founder was the very first to design a watch for a woman’s wrist. Breguet’s LA ROSE DE LA REINE collection has captured the rose that the French Queen is holding in the painting Marie-Antoinette à la rose and staged it in a cameo — the traditional southern Italian art of sculpture on the surface of a shell. Breguet has added a watch named Secret de la Reine to this suite of a ring, bracelet, earrings, a pendant and a sautoir necklace of Akoya pearls, either one or two metres in length. In the tradition of secret watches where the time is hidden, pressing the cameo rose reveals the hours and minutes. The unique sculpted floral cameo and bow decoration is in 18-carat white gold paved with 431 brilliant-cut diamonds, pivoting on a shaft to reveal the time. The dial flange is set with 48 diamonds. The dial is set in silvered gold, with 116 brilliant-cut diamonds. The Breguet medallion in white mother-of-pearl is inset at 12 o’clock. The PETITE FLEUR watch belongs to an enchanted world – in which the purest diamonds weave intimate ties between fine watchmaking and fine jewellery. The rounded aesthetic of the watch reflects the exquisite, vivacious and disarming nature of women. Movement lies at the very core of its personality. The fluttering of the baguette-cut diamond petals as they sway gently in time with the wrist is poetic and fascinating. Individually set in two rows, the 43 gems spring to life in complete freedom. The crystal-clear radiance of the petals surrounds and illuminates an entirely gem-set flower bud. Beneath a domed sapphire crystal bearing the individual number of the watch, a concave dial forms a shimmering flowerbed on which 141 brilliants nestle against each other according to the snow-setting technique. The individually cut and adjusted diamonds of varying diameters are arranged in such a way as to entirely conceal the white metal dial below. The flange frames the face of the watch with 48 inverted-set diamonds.A black satin strap creates a striking contrast. Its folding clasp set with 26 diamonds bears the Breguet initials.